Click here for 3 free secrets to Your Great Life Purpose, in the online course preview. Click here for a free preview with 3 free secrets to Your Great Life Purpose. Yes! You have a great life purpose. Your purpose is this... to do what you love, full-time. You can double your income by speaking about your passion, with secrets from my e-book, Your Great Life Purpose; How to Do What You Love and Double Your Income. 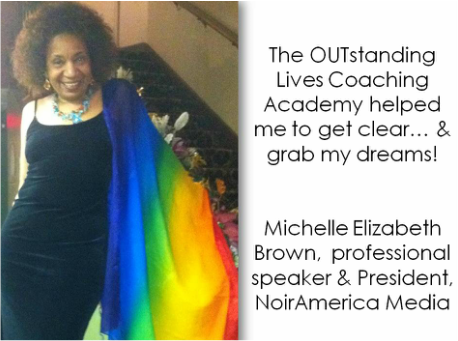 Would you like to learn the secrets that enabled me to inspire over 2,000,000 people to support equality, conquer homelessness, and help my clients attract over $5,000,000? Dare to dream of easily empowering thousands or millions of people, even if you’re shy. Imagine your jaw drop as you see that millions people have joined your online program. Feel your eyes welling with tears as you read heart-felt letters of thanks telling you about how you changed lives, or even saved lives. Imagine your eyes widen as your online bank account grows faster than your wildest dreams. If you enjoy speaking live, imagine feeling tingles down your spine as you get standing ovations. Dare to dream of enjoying the heart-warming smiles and handshakes of meeting managers who thank you profusely, as they hand you cheques for hundreds or thousands of dollars for each your talks. You’re probably wondering who I am and why you should listen to me. Hi. My name is Sharon Love, M.Ed. 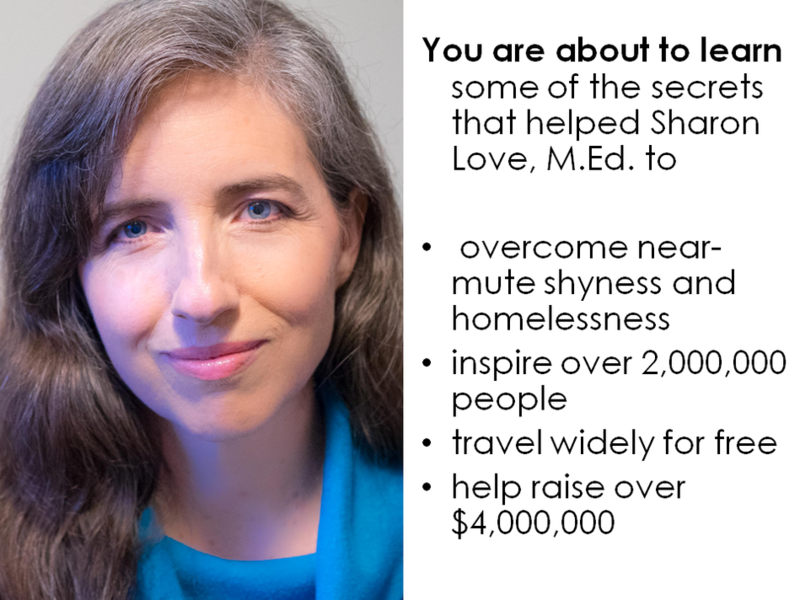 You are about to learn secrets that enabled me to conquer homelessness, inspire over 2 million people online, and help my clients attract over 5 million dollars. 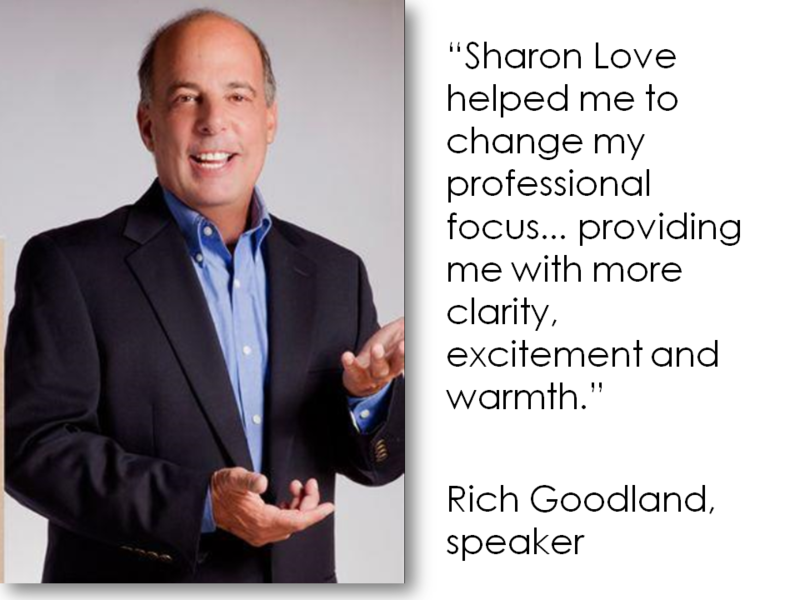 As a former speaker and corporate learning manager who hired speakers, I learned first-hand exactly how to attract high-paying speaking opportunities. If you have a passion for inspiring people, you probably have a gift for it. If you have a passion for speaking, it is your life purpose. You deserve your dreams. The world needs to hear your voice. You make a difference. I suggest you get pen and paper, because the secrets you are about to learn can change your life, and change your world. 2) click above to share this site. 3) click any "subscribe" button for my e-book, Your Great Life Purpose; How to Do What You Love and Double Your Income (right now, it's only $1/month). * For a time-limited special offer, you can get the e-book for only $1/month for twelve months. 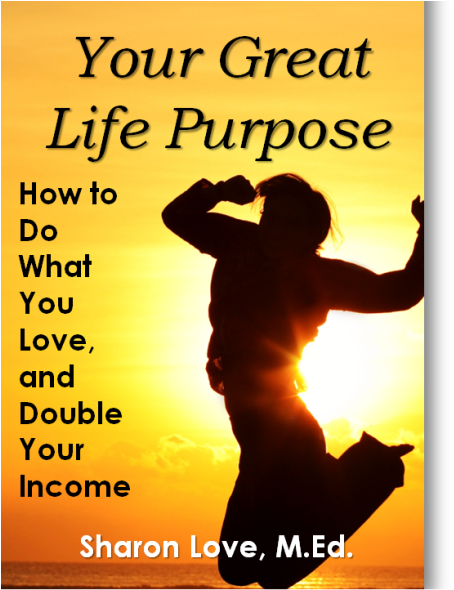 For instant access to your e-book, "Your Great Life Purpose; How to Do What You Love and Double Your Income", you can click click any "subscribe" button on this page. As soon as you complete your purchase, you will get directed to the e-book, so that you can start learning the secrets right away. Enjoy! Do you have an inspiring true story and/or a business that makes a difference, to submit for publication in the next edition of "Your Great Purpose"? If so, please click here!